The next round of economic reforms should address China’s widening wealth gap. Peking University’s Institute of Social Science Survey recently issued the “2014 Report on the Development of People’s Livelihood in China.” Quoting from the report, People’s Daily pointed out that wealth inequality in China has been increasing quickly. China’s Gini coefficient [Ed’s note: the most commonly used measure of wealth inequality, measured on a scale of 0-1] was 0.45 in 1995; it had grown to 0.55 in 2002 and reached 0.73 in 2012. Today, China’s wealthiest one percent account for over one-third of China’s total wealth, while the bottom 25 percent represent only one percent of the country’s wealth. There are two notable characteristics of the recent changes in wealth inequality. First, households where family members work for the government are noticeably better off than other households. In addition, their wealth is increasing far more than the wealth of families who work outside the system. Second, the wealth of middle-class households is increasing more rapidly than the wealth of both low and high-income families. This report attracted my attention. The widening gap between the rich and the poor is a serious problem, especially in a Confucian-based East Asian society that believes in the proverb “inequality, rather than want, is the cause of trouble.” Even more seriously, however, the wealth gap is caused by the use of power. Hong Kong and several Western countries also have Gini coefficients that are close to (or even worse than) China’s. But those wealth gaps have obvious causes in each individual’s family background, educational level, and individual abilities. What about in mainland China? It’s crystal clear that political power and wealth are both concentrated in the hands of China’s “one percent.” In other words, corruption is the main cause for the widening gap between the rich and the poor in China. This is a dangerous phenomenon! It’s especially dangerous as China has not established a democratic system that can alleviate conflicts between the people and the government, as Western countries have. If the trend continues, we might repeat the vicious cycle seen before in Chinese history: movements meant to fight corruption or even to oppose the rich and aid the poor become ever more common. Then the economic development and “harmonious society” created during years of stability disappear overnight, and China returns to the beginning of the historical cycle. For Chinese society, the most serious problem is not actually the gap between rich or poor, nor even the inequality caused by corruption. Rather, the most critical problem is that social mobility has become frozen; there’s no possibility of moving up or down the wealth ladder. This is the reason for the helplessness and bitterness I have felt many times when traveling to China’s villages and meeting China’s migrant workers. 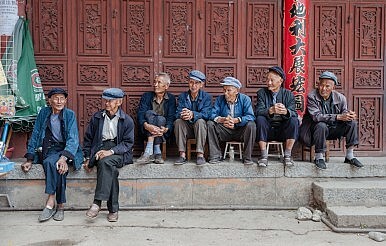 If the current situation doesn’t change, China’s disadvantaged groups (the huge numbers of rural peasants, plus those migrants who traveled to the city to find work) have no chance for upward social mobility. Before and after my recent visit to Tibet, I spent two weeks in the Pearl River Delta and Yangtze River Delta. There, I continued the social research that I have been doing for years on the living conditions of migrant workers (I began this research for the purpose of a specific report, but since then it has become more or less a “habit” for me, an essential way of staying in touch with this side of society). Many years after beginning this research, I’m still quite concerned about the circumstances and future prospects of these migrant workers. For years, I’ve followed 35 migrant workers (14 females and 21 males), and none of them have seen any real improvement in either their work or their lives (although I have lost contact with a few). Even worse, they all seem to be living for some imagined future, but they have no idea where this hope for the future comes from. This is why I finally lost my temper the other day when talking with a friend who works within the system. At the time, my friend was talking about Xi Jinping’s anti-corruption drive becoming larger and larger. He said that some officials are starting to have second thoughts about anti-corruption and reform. If this situation continues, my friend predicted, it will likely influence economic reforms and social stability, which are held together by the bureaucratic system. I responded by saying that China is developing in the direction of “small government, large society” by gradually dismissing and downsizing government workers. That strategy will both reduce government power and alleviate society’s burden. It was this last part that made me explode. The reforms of the 1990s resulted in massive lay-offs. Overnight, tens of millions of workers lost their “iron rice bowls.” There were people who didn’t want to accept it, even those who actively resisted, but the government ruled with an iron fist and eventually the reforms went through. Even today, some of these people have grown old on the edge of poverty. On a certain level, we sacrificed them in exchange for huge reforms to the economic system. Later reforms aimed at spreading the “made in China” label around the world sacrificed hundreds of millions of migrant workers. If we can say that reform has to sacrifice some interest groups, then we’ve definitely sacrificed common workers in exchange for some level of social development and prosperity. But the prosperity won through this sacrifice has components that are absolutely unhealthy, and even abnormal. For example, with prosperity came the dominance of certain interest groups, the rampant spread of corruption, and the loss of society’s moral “bottom line.” Our quick economic growth also made China the fastest country in history to nurture a group of “one percenters” who own one-third of the country’s wealth. To deepen economic reforms and realize social and political reforms that will make society more just and more equitable, China will have to once more bring order out of chaos. When the time comes, it will be necessary to sacrifice certain interest groups, including those government officials who currently enjoy power and privilege.